Evan Roberts went to Pastor Daniel Jones of his own church, the Moriah Calvinistic Methodist Church in Loughor, and asked to speak to the young people. Pastor Jones was somewhat reluctant, telling Roberts that "I might try and see what I could do, but that the ground was stony, and the task would be hard." Pastor Jones told Roberts that he could speak after the Monday prayer meeting that evening to anyone who was inclined to stay. 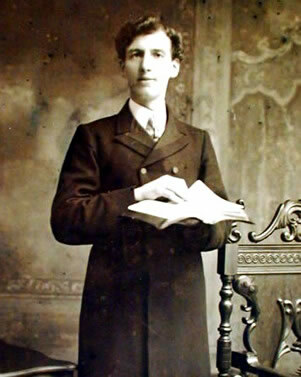 So, on Monday evening the 31st of October, 1904, Roberts spoke to 17 people who stayed after prayer meeting, telling them of his experiences and visions, and of his belief in a coming revival. The meeting was hard. The people were unresponsive and Roberts resorted to prayer three times during his long and protracted appeal. The Welsh Christians of that day had a reluctance about giving a personal testimony of assurance of salvation. But by 10 o'clock all 17 had testified of their faith in Christ, including Evan Roberts' brother, Dan, and his three sisters who publicly professed their faith for the first time. "Young men and women who had never been known to speak openly of any experience of saving grace stood and testified fearlessly". The first result of this personal revival was a change at home. Evan Roberts wrote to a friend, Elsie Phillips, about the events of this first week, "Our family has had a grand change. We have had a family altar this week for the first time. This again is the work of the Spirit. And last Wednesday evening, before the meeting, while I was away from home, they held a prayer meeting at home; and father for the first time prayed in their hearing. Another proof of the grand work." The beginning of the greatest revival Wales had ever known had brought personal blessing to the revivalist himself and his own family. In my last email I mentioned that I had been re-reading a little of the story of Evan Roberts and the beginnings of the 1904 Welsh Revival. The other morning at the chapel I was prompted to send you reports on a day-by-day basis about things that happened as they happened. And so here you have the first installment! I have kindly received permission from my friend Maurice Smith to use the material directly from his book, When The Fire Fell. So I will be sending out every day's portion from Chapter 2, "And The Fire Fell". These are the events leading up to the wonderful outpouring 110 years ago. After this vision, Evan Roberts went to Principal Evan Phillips (a mature Christian and a Moderator of the Welsh Presbyterian Church) and said, "I keep hearing a voice telling me you must go home and speak to the young people about Christ." He asked Principal Phillips if this was the voice of the Spirit or the devil. Principal Phillips wisely counseled him that "The devil does not give such thoughts. It was the voice of the Holy Spirit." So, on Monday, October 31, Evan Roberts decided to return home and conduct a week of meetings among the youth of his church. May these testimonies strengthen your faith and empower your prayers for God's visitation to the needy people of this world! 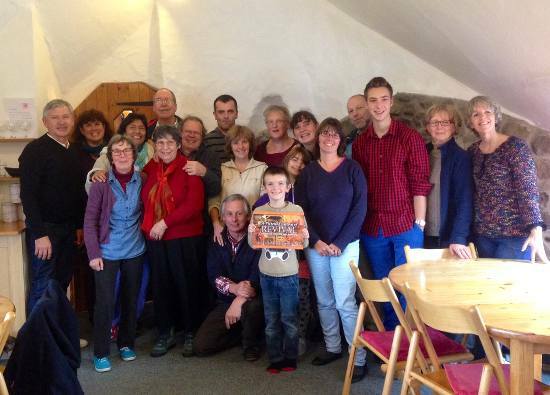 Last Thursday we had the priviledge of spending time with this group from southeast France who came to stay at Ffald-y-Brenin, the local retreat center that I mention frequently. They are the leaders of a small group of local fellowships in Les Arsures who came to have a short retreat and spend time seeking the Lord here. Our connection with the group came about through our long time friend Brenda who we've known since being here in Wales. 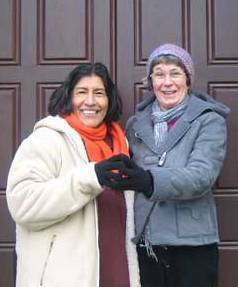 God called her to France as an intercessor in 2012, and we spent time praying with her in March of that year. You may have read the story at the time, or you can read it here in our updates. Brenda called to ask if we could come and share with them about the Welsh Revival of 1904, and of course I said we would love to join them. We arrived for a time of worship and prayer, and it was wonderful spending time together in God's presence. In spite of the language difference, the same Spirit flowed through us all and we experienced being God's family in a marvelous way. says, "And they overcame him [the accuser] by the blood of the Lamb and by the word of their testimony..." and that certainly holds true for us as well. The power of testimonies, whether our own or from others', are valuable for building up our faith! Our time together with these precious French brethren was a real blessing. France is a difficult place for the Gospel, and as we shared together we were all edified and encouraged in our missions—to see the name of Jesus lifted up before men and people brought to their knees before His throne of grace and mercy. We will be keeping each other in prayer, and invite you also to pray for this group of French saints in Les Asures. Thank you for your prayers, they are powerful and do make a real difference! On the way home from the Pembrokeshire Prayer Breakfast recently we did a little exploring. 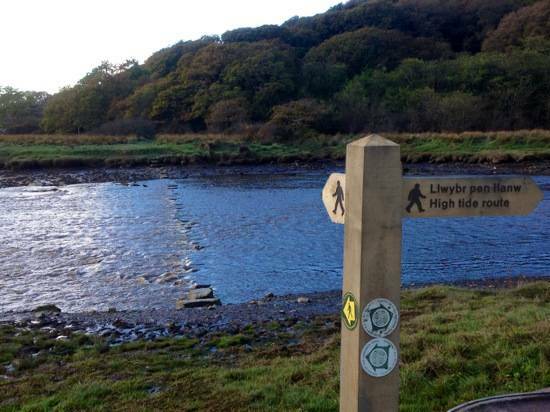 There are walking paths everywhere throughout Wales, and signs to point them out, but I'd never seen one like this before! I couldn't help but relate this to our walk with the Lord, and how when there are obstacles or difficulties in our path, He always helps us find our way through them or around them like in this picture. If we are willing to persevere in the direction He has given us, how good it is to know that His grace will be there for us. The scripture comes to mind in 1 Corinthians 10:13, "No temptation has overtaken you except such as is common to man; but God is faithful, who will not allow you to be tempted beyond what you are able, but with the temptation will also make the way of escape, that you may be able to bear it." Monday we had a wonderful overnight visit from our friends John and Janet Phillips. 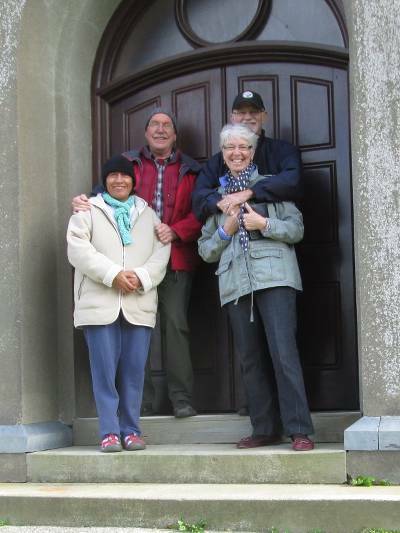 We have known her for several years as she and a friend make frequent ministry trips to Wales. However this time she came with her husband to show him some parts of country where both their ancestors came from. But there is a fascinating connection here that astonished us all when Janet discovered it a couple years ago. 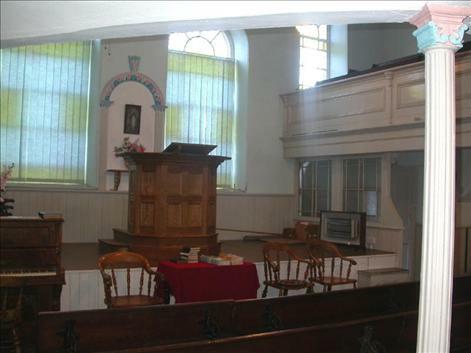 John's 7 times great grandfather was also named John Phillips, and he was the first pastor of this very chapel when it was formally organized in 1704. Now what are the probablities of our "running into each other" in a world of 7 billion people? And yet in God's Kingdom, there is no such things as impossible odds. His purposes are as unstoppable as His ways are at times undiscernible. And so as you might imagine we had a special time together here yesterday morning. We've taken many pictures of many people from many nations on these steps, but would never have imagined have a direct connection from over 300 years ago! We also have had some good news about the chapel—we have been invited to become members. For us this is an honor, and we know the Lord has His hand in this. And although we don't quite understand what it means, it feels like an important step in our being here, and we look forward to seeing what develops. As most things in this adventure with God, there is more than meets the eye. Thank you for your continued interest in our work here, and we really appreciate your prayers that the Lord continue to guide our steps day by day. 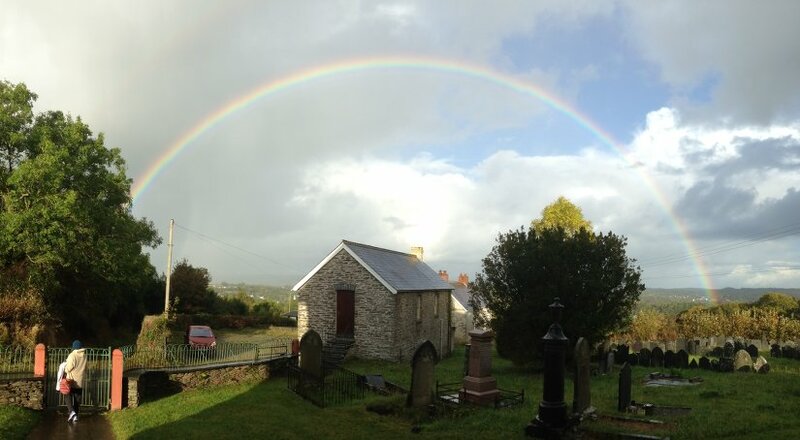 Amazing Rainbow, and even greater promises! This beautiful sight greeted our eyes from the front door as we left the chapel Friday morning. I had noticed part of a rainbow through the frosted windows from upstairs, but was not expecting to see this when we walked outside. Wow, what an awesome reminder of God's promises! Its funny that no matter how good the photographer or the equipment being used, a photo can never quite capture the true colors and brilliance of a rainbow. I was thinking about that a while ago and realized why. Any other natural beauty can be caught and appreciated through the manipulation of light and the gift of eyesight. But a rainbow is different. It is also perceived by our spirit because it is a particular and precious promise from God manifested in the physical realm. There is "something" more present that just refracted light—it contains the light of its Maker Himself! And 1 Corinthians 6:19 says, "...that your body is the temple of the Holy Spirit who is in you, whom you have from God..." And so combining these two wonderful truths, it stands to reason that as we surrender more and more completely to the Lordship of Jesus, only by His grace and power working in us and no works of our own, then His holiness affects everything around us, and especially people! This is the heart of the Lord, and part of His plan for revival. Jesus said in Matthew 5:16, "Let your light so shine before men, that they may see your good works and glorify your Father in heaven." Our light is His light. And our good works are His good works, as we can't do anything godly apart from Him. That's why people came running to find out what was going on at Pentecost when the Holy Spirit was poured out—to see His good works! When I looked again at the whole picture above, I noticed that the foreground is in the shadow of the chapel, but downhill from there everything is in the light. 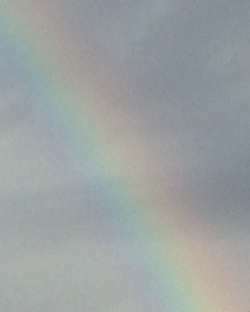 The rainbow seems like a doorway to the world awaiting the coming glory of God. It was a reminder that in or of ourselves there is no good thing, but working outwardly through us "...it is Christ in you, the hope of glory." as it says in Colossians 1:27. We are just the containers, the temple of the Holy Spirit. 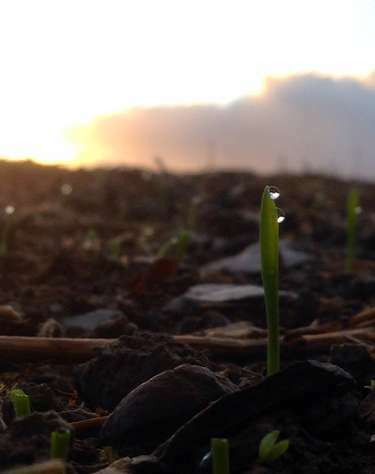 Just as the sun was coming up that same day, before going inside the chapel, I snapped this shot of newly sprouted winter wheat. It was sown only a week earlier and I had been watching closely for it, and that morning I could see the whole host just breaking through the ground. It was like a promise of new life to come. Another picture of the coming revival! Just can't help getting more excited about what the Lord is doing in our days, and even more about the days ahead. A simple weed... Professor Perseverance! It never ceases to amaze me how God finds ways to speak to and encourage us in our walk with Him. The other day was no exception as I was turning over part of our vegetable patch to keep the weeds from taking over. In one fork-full this interesting specimen appeared, dangling from one side of my spading fork. Prompted by curiosity, a closer examination showed this extra long dandelion root. I had turned over this section a couple months ago, and the broken root had remained buried in the soil about six inches deep. 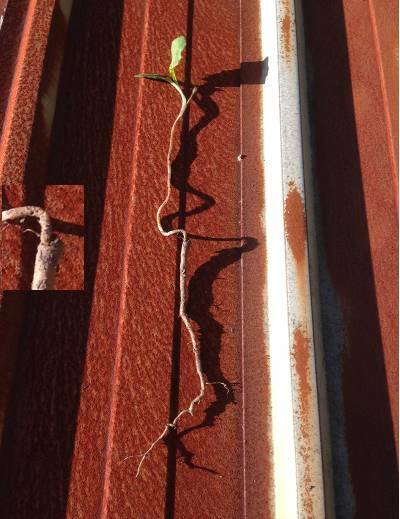 No problem - just start growing again from whatever you have left! Check out the inset to the left for detail. Cut and bruised, with only about half its live cells to start from, against all odds, up it came. Talk about determination! What a lesson for us in perseverance. Paul says in 2 Corinthians 4:8-10, "We are hard-pressed on every side, yet not crushed; we are perplexed, but not in despair; persecuted, but not forsaken; struck down, but not destroyed - always carrying about in the body the dying of the Lord Jesus, that the life of Jesus also may be manifested in our body." Most of us can't begin to say we have had such difficulties in our Christian experience as Paul or many others in the records of scripture. 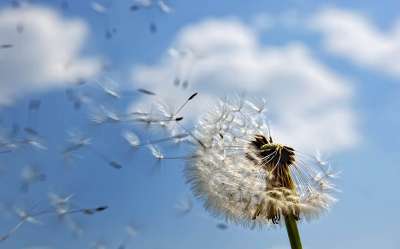 However we all experience setbacks and discouragement at one time or another, and perhaps many times, or even most of the time. But there is this incredible hope and purpose that calls us onwards - "...that the life of Jesus also may be manifested..."
Wherever we happen to live or whatever our circumstances happen to be at the moment, our purpose and calling remains to same - "In Him also we have obtained an inheritance, being predestined according to the purpose of Him who works all things according to the counsel of His will, that we who first trusted in Christ should be to the praise of His glory." So let us press on undeterred with singleness of heart. And through our simple determination to make room for the wonder and joy of His life to be seen in us, let's pray that people be pointed towards Jesus.